Live stream will be available from our Facebook and Event pages, and at https://stopthedrugwar.org/philippines, from about 1:00pm. Extrajudicial killings in nations' "drug war" campaigns have plagued multiple countries. This session will review the current situation in countries affected by extrajudicial drug war killings, national and international advocacy efforts to stop them, and interrelated matters such as social media manipulation and the struggle to promote and preserve democratic institutions. This forum follows on our 2017 CND side event, "Human Rights Challenge: Responding to Extrajudicial Killings in the Drug War," which featured a video from Vice President Leni Robredo that criticized President Duterte's drug policies. The video became controversial in the Philippines, leading to weeks of political attacks on Robredo including calls for her impeachment. 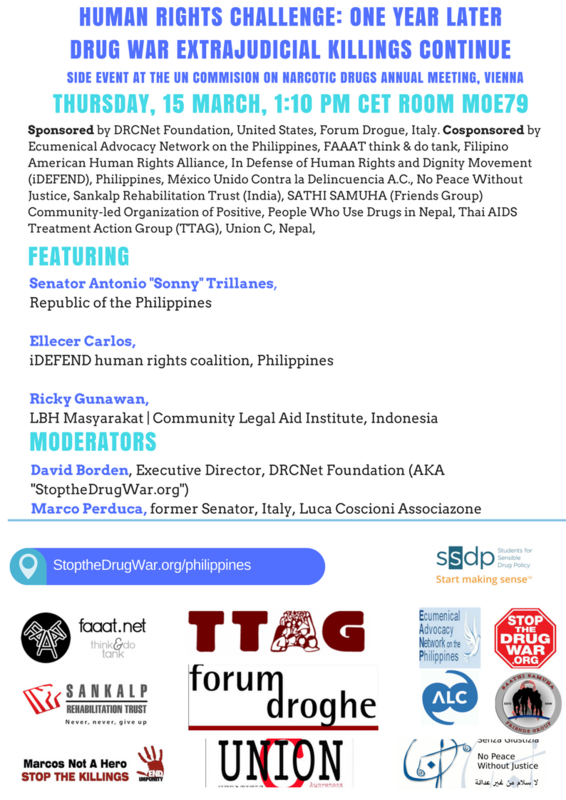 Visit https://stopthedrugwar.org.philippines/ for further information, including links to video footage, transcripts, press coverage and other information.